The growth story of China ABS shows domestic investors have done just that—got used to the volatility. Ever since China’s 2013 Third Plenum market reform agenda gave a big initial boost to its development, China’s ABS market has developed rapidly but not necessarily sustainably. The watershed in growth began sometime late 2014 – early 2015, coincident with the term of my grant from Swift Institute. The most pressing question about China’s ABS market seemed to be, which market institutions would be early adopters—which would put their commercial imprimatur on the market structures and standards? Then, the answer then was not clear: Leaders are change agents. Change requires disruption. From early contact with market participants I sensed a will to comply with government policy but no will to disrupt. In mid-2014, global confidence in China’s macro-economy and financial reform progress was still high. My detailed findings can be found on the SWIFT Institute Research page here. Since the paper’s publication in September 2015 and presentation at SIBOS in October 2015, pressures on China’s capital market development have continued unabated. Concerns about debt overhang and asset impairment have mounted. China’s P2P (marketplace lending) market has to some extent collapsed, and this both a significant and a positive development for China’s ABS market. China’s ABS market growth has continued to exceed expectations. China’s ABS market character is also changing, concretely, in tandem with the evolution of its economy. Specifically, the glut of credit products is making ABS is becoming riskier and also driving the development of ABS as a risk management tool rather than simply a new channel for consumer credit. 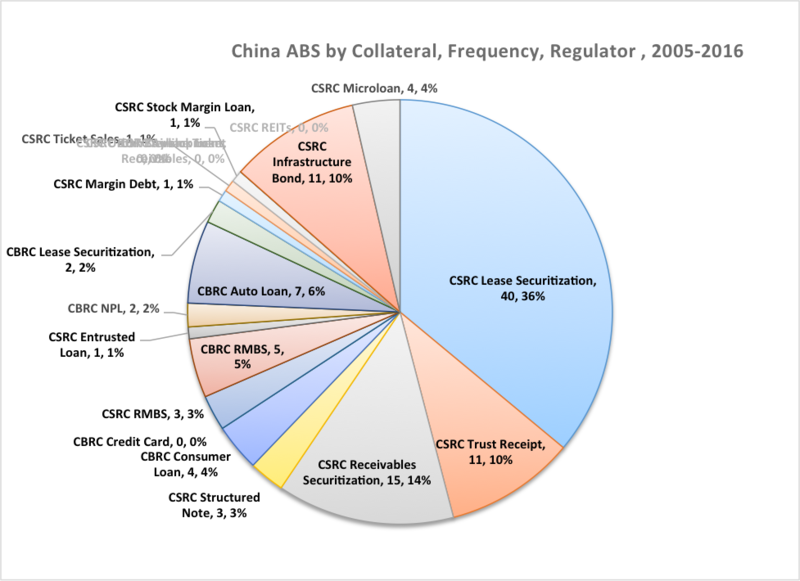 As these trends were predicted in the growth schematic outlined in my paper, China’s need to develop a mature market understanding of ABS risk is palpably intensifying. In 2014, I thought the most plausible ABS market development scenario in China was for marketplace lending giant/Fintech disruptor Alibaba to take the lead. Alibaba was a pioneer in microfinance with experience in China’s domestic ABS market. But that is not how things turned out. This juxtaposition of ABS with P2P may seem odd from a mature market perspective. That is, formally their networks and risk features are different. ABS is regulated; P2P is unregulated; China ABS is a funding channel for banks and SOEs; P2P is an option for non-banks to serve entities whose high default risk and administrative costs present barriers for many large commercial lenders. However, they in common that they were designed as “alternative” markets. Both utilize digitized credit analysis. Both involve shadow banking. The secondary market disclosure requirements of both are substandard. Yet, until very recently, government had a policy interest in promoting both ABS and P2P. Until the end of last year, China’s central government, the PBOC and Shanghai’s securities regulators had promulgated or proposed tougher regulations. Anecdotally, inside certain ministries not directly involved in finance, P2P enjoyed a certain cache as a credit product that did not come from banks. 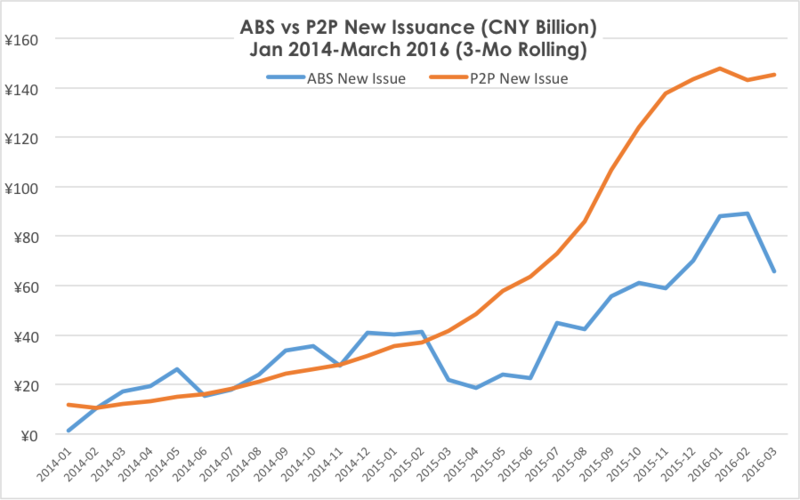 Since December 2015, the viability of P2P in China has been called into question with the fall of eZubao. More recently, the failures of large P2P lenders like Lending Club in the U.S. and Deer Financial in Shanghai have cast a shadow on the future of P2P. Everything else being equal, ABS should benefit directly from P2Ps reputational risk. It is also possible that the adverse P2P experiences and the connection of ABS to shadow markets could create momentum for bringing ABS disclosure requirements up to the standard of other markets globally. ABS experienced dramatic growth rates in 2014 and 2015, but it was an open question whether the market would continue on its growth trajectory or stall out under the weight of the other macro-economic and credit market concerns. That question has been laid to rest. Below, the table shows plainly that China’s ABS market growth is still accelerating. The period July – December 2015 accounts for 49% of total issuance in the market’s history, and issuance in the period January – May 2016 alone is 14% of total issuance. It is an extraordinary 25% higher than for the full first six months of 2015. Since the beginning, ABSP transactions (CSRC-regulated) are now 60% of the market. The percentage in 2016 is nearly 75%. Cumulatively CASS transactions (CBRC-regulated) are 40%. The 2016 percentage is a little over 25%. Bread-and-butter consumer asset types in the U.S. that grew rapidly in the CASS markets during 2014-2015 are off this year. They include credit cards, auto loans, consumer loans and RMBS. The rate of originations for grass roots collateral, like microloans and infrastructure bonds, also decreased. CLOs, cumulatively 27% of the origination but in 2016 were only 11%, a change of 16.2%. Microloans decreased 4% and infrastructure bonds decreased 3% relative to cumulative origination. REITs and urban development ABS did not pick up. Risk transfer deals so far present a mixed picture. Transactions backed by risky collateral like stock margin collateralized deals, BOT buyback loans, entrusted loans have decreased or not increased. But originations of lease securitizations, trust receipts and receivables financing in the ABSP (CSRC) markets increased 12%, 4% and 3%, respectively. Overall, these changes suggest two trends. First, in 2016, the ABS market has been used primarily for recapitalization and funding arbitrage rather than to finance consumption, as was true in 2014 and 2015. Second, despite the funding market disadvantages of the ABSP market identified in the Swift Paper (less legal certainty, the need for corporate guarantees on top of collateral-based credit enhancement ) its growth rate exceeds that of the CASS market, which has many policy advantages. I consider this is to be quite a positive development, given the strategic importance of the ABSP market for recapitalizing China’s state-owned sector. To come full circle on volatility, while the data show rapid adaptation of ABS deal types to the changing environment, the ratings on some mezzanine tranches (below the senior level in the capital structure of ABS deals) seem unrealistically high. These ratings, which Chinese investors accept, appear to reflect a very different risk understanding from that in the U.S. Moreover, Chinese investors do not have access to pool- and even loan-level data that are required public disclosures in the U.S. Sooner or later, these gaps in market practice are likely to impede further market growth. Who will take the lead in maturing China’s ABS market, and how? Will the government promulgate regulations mirroring those in the U.S.? Or, alternatively, will commercial leaders rationalize the market by making money from the inconsistencies? Stay tuned. I expect to see answers by 2017.